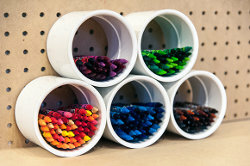 If you need a little help with craft room organization, this is the project for you. Create your own Storage Station with PVC Cubbies using materials found at your local Home Depot store. You won't believe how easy it is to construct this desk. Attach the MDF panel to the adjustable sawhorse with wood screws. 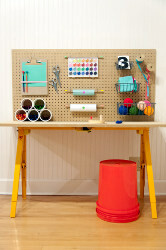 Place the desk against the wall in the desired loca­tion, first locat­ing the wall studs for mount­ing the peg­board. Mount the peg­board to the wall using wood screws. Don’t for­get to use spac­ers with the mount­ing screws to allow room for mount­ing accessories. Decide on the lay­out for your cub­bies, heat up your gun and glue them together. It doesn’t get much sim­pler than that! Hi there! The save button is located just under the instructions for the pattern. It is a gray button with a plus sign that says save. I just checked my account and can see my past saves. Are you looking on the computer or on your phone? Let me know, and I can look into this! Thank you! PVC STORAGE Excellent Idea and use of products!! Would like to see a larger photo!! I'd probably make a back frame for the peg board and hang it on the wall and put a pillow top on the bucket to use it as a child's art and school work desk. I'm looking forward to doing this one! I do think that this is a cute setup, but I would have liked to read more details. Some pictures of how the desk comes together would be helpful. I am not sure I understand how the peg board is attached either. Having more written and visual information would be useful. Finally, I do not get it why there is a bucket in the materials list. Adorei a idia, no vejo a hora de p-la em prtica.